Eliane Correa y En El Aire Project’s multinational crew from the Caribbean, South America, Europe and Africa dedicated an ode to the Cuban Santeria saint Changó, ruler of drums, dance, war and fire. The piece started with an invocation to the Orisha chanted in the Yoruba language and accompanied solely by batá drumming. It then transformed into an explosive soul and jazz fusion with evocative lyrics in English, which spoke about the fire in our souls. This was supplemented by an intense trumpet and base, with short staccato saxophone and drum set interventions. Other pieces fused soothing jazz with Afro-Cuban rumba beats, and offered empowering lyrics about women’s strength and beauty enhanced by conga rhythms. Finally, the evening transformed into a Cuban descarga (jamming) with soul, jazz and flamenco singers joining the stage to share the passions in their souls through music. En El Aire’s emotive multicultural repertoire reflects the artists’ desire to push the boundaries of the intersection between Afro-Cuban and Latin Jazz to a new level, one that expresses cultural and musical collaborations in London. The project also exhibits the strength of the London Latin Jazz Fest in its fusions and innovation. En El Aire’s music further set the scene for the festival’s fifth edition where diaspora musicians journeyed from their cultural and musical roots to their life in London through jazz and world music collaborations. Spiritual jazz Teotima Ensemble brought together sounds from West Africa, Cuba, Brazil, classical American soul and funk. Osvaldo Chacón’s full band fused jazz, salsa, soul, funk, and Afro-Caribbean music. The closing performance by Latin jazz pianist Alex Wilson and salsa soul vocalist Nolita Golding transformed the night into a fiesta (party), celebrating the cultural and rhythmic diversity of Latin jazz and dance music in London. Wilson’s diverse upbringing between Sierra Leone, the UK, Austria and Switzerland was apparent in the energetic and multi-rhythmic music of his 12-piece salsa band. This versatile background is also evident in his further work which includes composition and production of Latin Hip Hop, and commissioning of a British black theatre company. Through her vocals and lyrics, second generation diaspora Golding revealed her passion for fusing jazz and soul, while drawing inspiration from her mixed Spanish, English and Mexican heritage. Kishon Khan’s two projects Lokkhi Terra and Dele Sosimi and Cubafrobeat performed subsequently on the fourth evening of the five-day Fest. Born in London, Lokkhi Terra is currently the only collective fusing jazz with Bangladeshi folk beats, Afro-Cuban rumba and Afrobeat from the districts of Lagos. The second show by ambassador of Afrobeat Dele Sosimi in collaboration with Cubafrobeat continued well beyond closing time. The evening started with Dizzie Gillespie’s classic piece Caravan sung in Spanish, moving on to Afro-Cuban jazz and traditional music as well as original Fela Kuti songs, keeping the soul fire of Nigeria’s political activist and creator of Afrobeat alive in the heart of London’s Soho district. Historically and politically charged, the event brought to life stories from the past connected to imperialism, slavery, and political discontent. More than a musical experience, the show recalled Kuti’s fight against oppressive regimes through his music, integrating funk, jazz, salsa, Calypso and Nigerian Yoruba music, and political lyrics sung in Pidgin, English and Yoruba with song length ranging around 15 minutes. The evening also recalled the ancestry of Afro-Cuban music from the Yoruba land of West Africa through soulful rumba singing and batá drumming, which transformed Pizza Express Jazz Club into the Callejón de Hamel, the shrine of Afro-Cuban music, religion and culture in Cuba’s capital Havana. It further reminded of the birth of Afro-Cuban secular, religious and jazz musics as a result of the displacement of the African diaspora to the New World due to slavery. This journey into history did not convey feelings of longing, nostalgia or suffering by exiles. On the contrary, it was a celebration of the rich historical and cultural roots of African and African diaspora musics, and the musicians’ pride in their traditions. Heritage is the match which lights the artistic fire of creating new jazz and fusion musics by diaspora musicians in London; it is also the bridge between their former and new home countries and environments. Deeply devoted to Afro-Cuban music, Cuban diaspora musicians in London are also expressing their love for jazz, neo-soul, R&B, digital fusion, urban Latino and world music. Drawing inspiration from their traditions and musical training, these artists strive to innovate and push the boundaries of jazz, fusion and Cuban music, and celebrate the cultural and music diversity of London. Their souls are powered by a belonging to multiple locations and cultures, a passion for honouring heritage while aspiring to produce cutting-edge fusions. 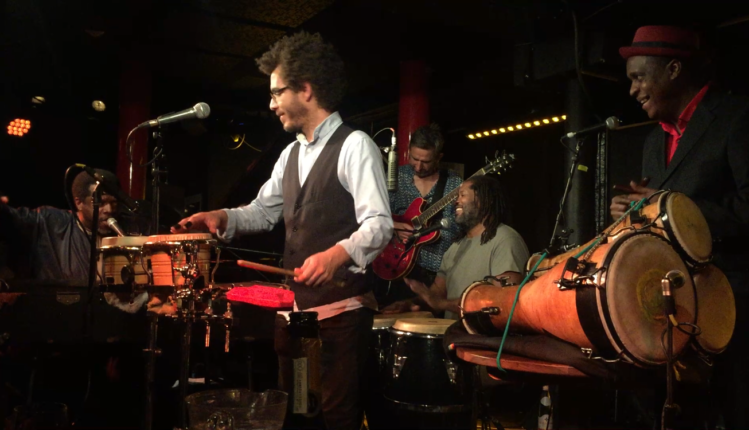 Hence, while influenced by London’s revived jazz movement, music and cultural diversity, Cuban musicians are in turn shaping London’s Latin jazz and fusion scenes, which lie at the heart of this movement. It is very interesting to read about how Cuban music develops in London !!! © 2017 CubaEnCamino all rights reserved.